Give yourself more control and room to move with this bar kit including bars, throttle (with or without brake perch), 3" longer brake cable, 2" longer throttle cable with carb cap (stock 50 or 17mm), kill switch and grips in a colour of your choice! Throttle/clamp available in Black, Red and Silver with Flame or USA bar pad! Silver, Red, Black, Blue, Gold, or Sky Blue. The first triple clamp ever made for the xr/crf 50. Made from aircraft grade Billet aluminum. Macined Fast50s logo on top. It has 2 adjustable settings for youth & adult. Moves the bars forward and up 1" so that you're more comfy for any type of riding/racing. Fast50s Billet shifters are made from aircraft grade aluminium with precision broaching for an exacting fit. They are also anodised in your favorite color. This folding tip has an aggressive knurling to ensure your toe does not slip our from under it. Make your bike look stronger and look even more trick with this fantastic product from Fast50's! Give yourself more foot room with these pegs which are Wider, Stronger, and Lighter than your stock pegs and are 3 1/8" Long and 2" Wide! Choose silver, black, or red. Sold as a pair! Uses your stock springs and pins. Available without brake perch, just ask! Fits 7/8th inch bars - this will not fit on the stock bars. This full size complete billet assembly with attached perch which runs your stock brake lever and bolt. This is CNC aircraft material, not that plastic rubbish you get with other throttles, one of the best throttles on the market! These are the best grips on the planet. These Oury Grips are the best because they are just grippy enough to hang on good, but not too harsh on your hands unlike other grip!. Available in a range of colours! Some riders want the BMX feel of the rear brake on the bars instead of with your foot, this is the kit you want! You're able to now rail a berm and not worry if you cant reach the rear brake pedal with your foot. Also you can drag a sick right hander and the brake and use it like a clutch, to carry more turn speed. Fits stock swingarms or after market swingarms with 7/8" or 1" tubing. -Adaptor enabling you to run both hand and foot at the same time!! 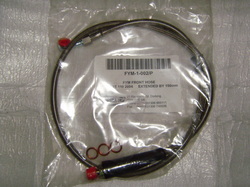 Fits Fast50s Throttle Cable - this is for replacement or if you are upgrading to a 17mm carb and already have the cable. This is the same billet carb cap that comes with our throttle cable. Available for 50 or 70 carbs! Comes with billet carb cap for either Billet xr50/crf50 or xr70/crf70 carb. This cable is for the stock carb, so if your wanting a little extra length or if you rigged up your own high rise set-up then this is your cable. This is 36" end to end and is the same front brake cable in our complete bar kits. So if you need a little extra length, or rigged up your own high rise set-up then this is for you. This is a 150mm extended brake hose for a X-Sport 110cc MiniBike/PitBike, an essential upgrade after those upgraded higher bars! This is a great piece to start or finish any one of your bikes. These are CNC machined and come with a delrin rubber seal. Make your bike look really trick with this which is made out of aircraft grade 6160 aluminum with a quality o-ring. Machined Fast50s name on top too! Finish off your bike with this Fast50s Billet Top Head Cover with gasket which fits all years Honda 50 and 70's! Fast50s Cam Cover and Gasket which fits all Honda 50's and 70's. Comes with the Fast50s logo machined into it. Available in 5 colours - Red, Blue, Gold, Silver, or Black. Billet anodized valve tappet covers fit all years Honda 50's and 70's and comes with high quality o-ring for non leak seal. Looks sweet and cools your engine better than stock covers. Made of quality material that will not break down like others. Puts both taller kids, youths and adult riders in a more comfortable position for any type of riding. Cover to go with the item above or re-cover that nasty old foam and make it look brand new! Fast50s Logo on top rear. Choose for stock foam or tall foam. Make your bike stand out with this graphics kit from Fast50s! Would look mint with the item above and the USA Bar Pad! Get your 50 looking tricked up with these graphics from Fast50s. Goes nicely with the SupraGrip Seat Cover too! Get this graphics kit and stand out from the crowd! Looks great with the Flame Bar Pad and SupraGrip Seat Cover! Heres something to really make your 50 stand out and look amazing amongst the rest! A PINK graphics kit from fast50s, looks mint on black plastics also available from us, just ask for a price! Fast50s Bar Pads fit 7/8 inch crossbar. FastMinis fits thinner bigger mini bars. Handle bar pads look great and fit's the Fast50s bars (email to ask for price) as well as any big bike bar too!